These tacos are fresh, light and super filling, are you getting what I’m putting down? These fish tacos are a party for your mouth and super healthy to eat. and you can’t have one without the other. The trick to a perfect, seared outside starts with a SIZZLING HOT skillet, I like to use my cast-iron. 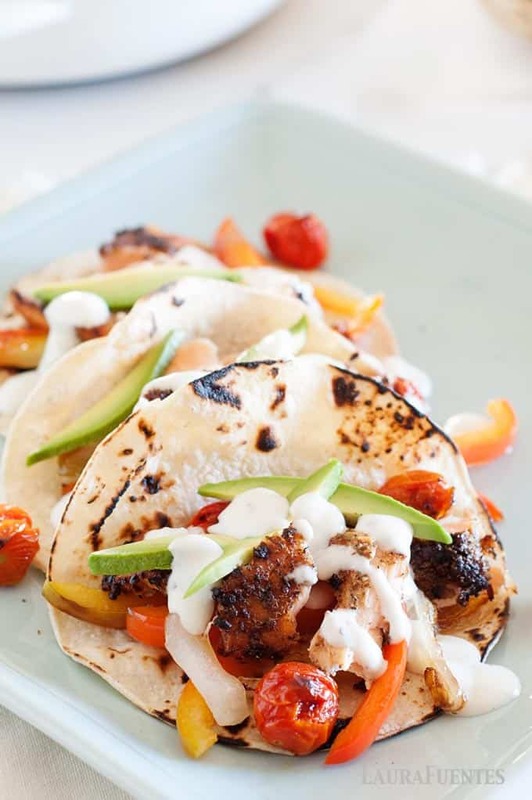 It gives the veggies and salmon those slightly charred edges and makes these tacos dreamy. You can grab the blackened seasoning I use on Amazon, I highly recommend it as a staple in your spice rack. Here in the south, we use it like salt on meats, seafood, and burgers. If you are trying to eat healthier but don’t want to give up taco night Salmon Fajita Tacos are the way to go! Veggies, salmon, loaded into a tortilla and topped with Creamy Cilantro Lime sauce- it’s the epitome of a healthy meal. And that goes with any of the Taco Tuesday Cookbook recipes, they’re all made with fresh ingredients stuffed into a tortilla and drizzled with sauce. It’s a complete, healthy meal in the palm of your hand and I can never get enough of them. Fish tacos are my second language and one of my favorite parts in The Taco Tuesday Cookbook. There’s Grilled Fish tacos, the other Blackened Fish tacos, and my Baja fish tacos which taste equivalent to a mini beach trip to Mexico. OOOOH, this is one of my favorite parts, the toppings! This recipe uses charred grape tomatoes, sliced avocado, and creamy sauce. 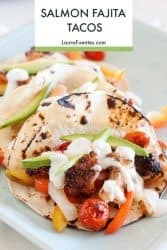 To make it more classic fajita style you could go for fresh pico de gallo, sour cream, and guacamole. It’s all up to you but just know when it comes to tacos, you do you. The only sauce for these fish tacos is my infamous Cilantro Lime drizzle. It’s perfect for all things tacos, salads, grilled chicken and veggies, I practically drink the stuff. This recipe can be made ahead of time and stored in the refrigerator for 5 days. So are you a fish taco fan? 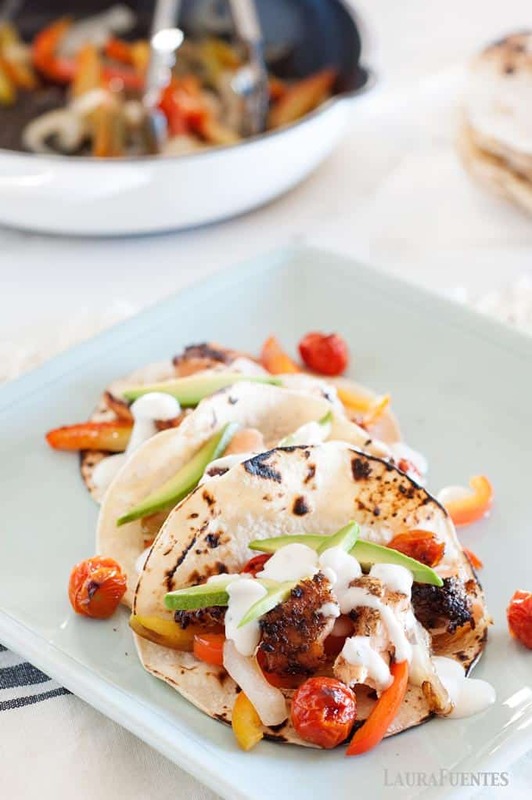 If so, then these Blackened Salmon Fajita Tacos need to be in your very near future. 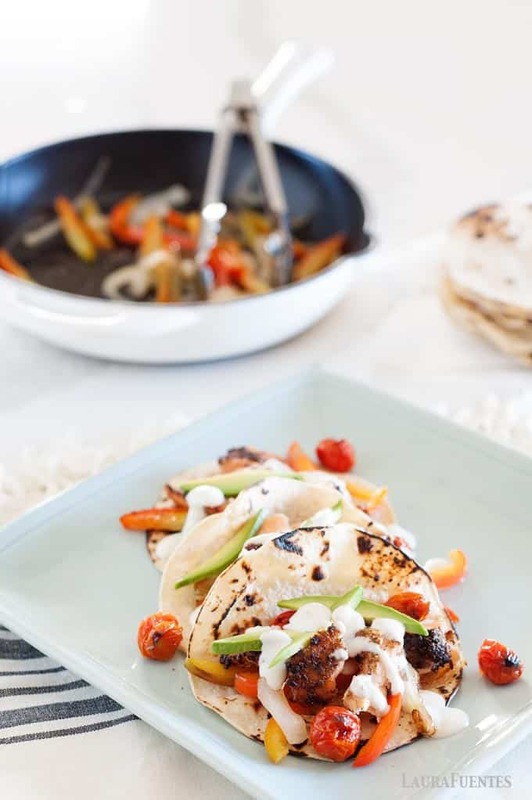 Get the recipe for these fish tacos from The Taco Tuesday Cookbook, I promise you’ll thank yourself.